For anti-aircraft artillery batteries, see anti-aircraft warfare. "Micro cell" redirects here. For the chemical compound, see Calcium silicate. AAA batteries are most often used in small electronic devices, such as TV remote controls, MP3 players and digital cameras. Devices that require the same voltage, but have a higher current draw, are often designed to use larger batteries such as the AA battery type. AA batteries have about three times the capacity of AAA batteries. 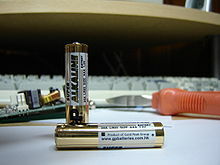 With the increasing efficiency and miniaturization of modern electronics, many devices that previously were designed for AA batteries (remote controls, cordless computer mice and keyboards, etc.) are being replaced by models that accept AAA battery cells. As of 2007, AAA batteries accounted for 24% of alkaline primary battery sales in the United States. 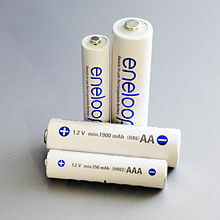 In Japan as of 2011, 28% of alkaline primary batteries sold were AAA. In Switzerland as of 2008, AAA batteries totaled 30% of primary battery sales and 32% of secondary battery sales. ^ "ENERGIZER E92 PRODUCT DATASHEET" (PDF). Retrieved 9 January 2014. ^ Life Cycle Impacts of Alkaline Batteries with a Focus on End-of-Life - EPBA-EU. ^ "Archived copy" (PDF). Archived from the original (PDF) on 2012-03-25. Retrieved 2015-02-23. CS1 maint: Archived copy as title (link) INOBAT 2008 statistics. ^ Monthly battery sales statistics - MoETI - March 2011. ^ "Your guide to types of household batteries". michaelbluejay.com. Retrieved 16 February 2018. ^ Heinz Albert Keighne, Battery technology handbook, CRC Press, 2003 ISBN 0-8247-4249-4, page 374. ^ Defence Standards: 61 Series - Electrical Wire and Power.